Shy Brothers’ Ayrehire and Holstein dairy cows were saved by switching to cheese production. 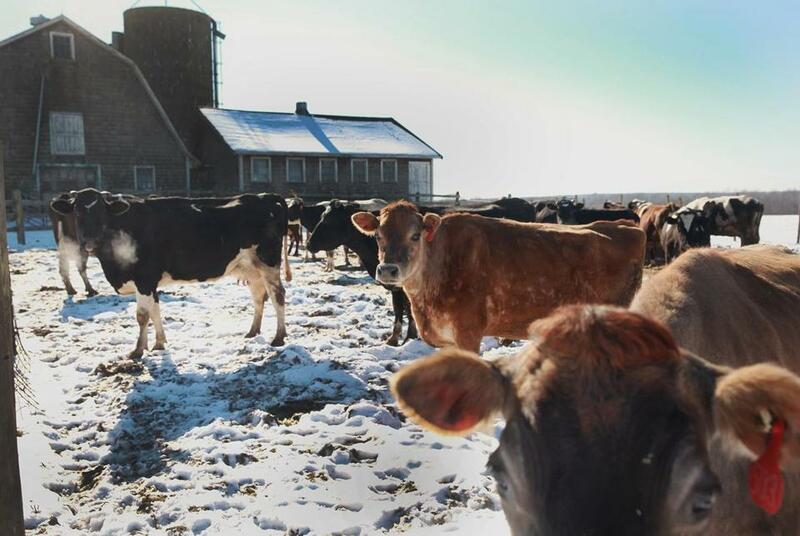 Between the two branches of the Westport River, and a very short distance from the Atlantic Ocean, lies a third-generation dairy farm owned and run by the Santos brothers. The brothers, Arthur, Norman, Kevin, and Karl, share responsibilities on the farm. Before 2007, they milked cows and sold the milk wholesale, but this was tough financially, as the government regulates milk prices, and the farm started losing money. This problem was not unique, and many farms in the area closed. In 2007 Barbara Hanley, who is president of the Massachusetts Cheese Guild, connected with Karl to find a way to help him save the farm. Barbara and her husband, Leo Brooks, partnered with the Santos brothers. Barbara, Leo, and Karl went to New Hampshire for a weekend cheesemaking class. Then Karl and Barbara went to France for two weeks, where they found a cheese called boutons de coulottes (trouser buttons). Karl returned home with the recipe, tailored it to the dairy’s milk, and began making Hannahbells, tiny, thimble-shaped artisanal cheeses named for the brothers’ mother. Karl chose this particular cheese because it was different from what anyone else was doing in the states and it has a short turnaround: The cheese is ready just a few days after milking. The Hannahbells are individually molded, bloomy rind, lactic cheeses. The cheese starts with milk from the brothers’ Ayrshire and Holstein cows. The salty air at the farm moderates the temperatures, allowing the cows to stay at pasture longer than most in the surrounding area. The salty air also affects the grass the cows graze on, which in turn affects the flavor of the cheese. Even if someone used the exact same recipe that the Santos brothers use, he couldn’t produce the same cheese because of the unique characteristics of the soil, grasses, and climate. This actually allows for collaboration among cheesemakers rather than concern over producing and competing with the same product — something that Karl and Barbara are very active in, being members of the Cheese Guild. They both want to take what they’ve learned about sustaining the Santos brothers’ farm and share it with other farmers. The milk for the Hannahbells is harvested each morning, brought over to the cheese house in Dartmouth, then pasteurized according to FDA and Massachusetts cheese regulations. Cultures (lactic bacteria) and rennet are added, the curd comes together (the whey is used to feed other farmers’ pigs), and after five days of culturing, the cheese is molded and the rind is allowed to develop. The Hannahbells are then moved to the ripening room. This takes a total of 10 days, and then the Hannahbells are packaged. As she explained the process, Barbara praised Karl’s knack for cheesemaking, saying that he has this sense for when the cheese is fully ripe. The Hannahbells come in four flavors: Classic French, Shallot, Rosemary, and Lavender Bud. Barbara says people often think they add cream to the Hannahbells because their texture is like that of a triple-cream cheese, but the little thimbles are actually a single-cream cheese that’s gently handled. The Hannahbells are a lot of fun to cook with and also a dainty-looking yet complexly flavored addition to cheese plates. Barbara says chefs and caterers really like to experiment with them because they can be used in both sweet and savory applications. A newer cheese, Cloumage, is made from the Hannahbells’ curd. Barbara claims she’s not much of a cook, but that cloumage can make even noncooks look good. The lactic curd is like a tangy ricotta and works well in baking (think of using it in place of sour cream or crème fraiche), as well as stirred into pasta dishes for an extra boost of flavor. Hannahbells and Cloumage are sold at several markets in the area, including the Bloomy Rind (Hingham), Whole Foods (Dedham, Hingham, and Weymouth), and How on Earth (Mattapoiset). The cheeses can also be found at the Marshfield and Plymouth winter farmers’ markets. And to see what area chefs are doing with them, visit Steel & Rye (Milton), where Cloumage is featured in the chips and dip snack and the Hannahbells are used in a mini grilled cheese. The brothers also make unstretched mozzarella curd, a recipe they developed with Fiore di Nonno in Somerville. The curd can be purchased on the Shy Brothers Farm website — pulling instructions included. It is also sold by Fiore di Nonno at farmers’ markets and specialty stores in the form of fresh mozzarella, string cheese, stracciatella, scamorza, and burrata. And it’s provided to some restaurants, where it is pulled to make finished mozzarella. dishings.blogspot.com. Follow her on Twitter @DeliciousDish.